This is a very nice quality crepe polyester skirt with carefree. permanent pleating--stitched down 5" on hip area. Concealed side zip and covered button fastening. Length 34" including waist band. Excellent hardly used like new condition. 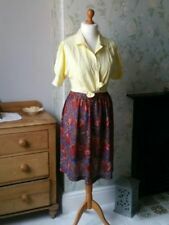 Vintage St.Michael (Made in UK) Cream Pleated Summer Skirt size 12 . Condition is Used. Dispatched with Royal Mail 2nd Class. Really lovely and genuine vintage cream/ivory skirt. Not quite right but couldn't decide if it was cream or ivory do put both. Remember also though vintage size 12 was very small compared to our sizes nowadays - more like a 10 or even 8 in today's sizes. Thank you for looking. Marked a size 16. but more like a 14. Made in the UK. Great condition. Magenta colour. Dress is lined and great smart wear -. Jeager leather pencil skirt. Size 14. Vintage, made in Great Britain. Sits on the knee and is in near immaculate condition. 1940s Style. Wool Skirt. Size 14 Modern Size 8/10. Size - Italy 40 (UK 8). Made in Italy. 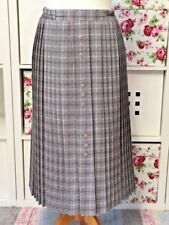 This is a beautiful 1960/70s La Jupe grey wool knee length skirt. It has one side pocket and a lovely purple button closure on the left side. There is a tiny hole in the bottom hem but that's not visible when the skirt is worn because it stays under the side seam (see photo). 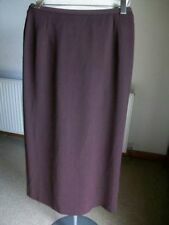 This is a stunning 1980s Jaeger knee length pencil skirt. Back zip & hooks. Material is 100% viscose (viscose lining). -length: 63 cm, 25". Beautifully handmade pencil skirt in raw silk. up to 40" hip. 🌼 Made from pure new wool. 🌼 Zip up with hook. 🌼 Length 28”/71cm. 🌼 Waist 30”/76cm (a weeny bit over 30”). Need more information about an item?. 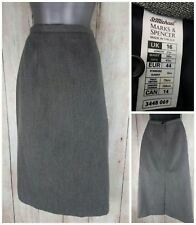 Very clean and used grey wool size 14 skirt, the skirt has a lining inside it. Marion Donaldson. Fabric Composition:73% Polyamide, 27% Viscose. Style:A-Line Skirt. Size:UK 12. Lining:100% Polyester. ClosureZip and Button. Very Good Condition. Excellent condition as new. Smart Marks & Spencer 90’s ivory/beige lined wool 45%, polyester 55%, calf-length wrap skirt. Fitted around hip with 4 vertical darts in the back & 2 in the front. Right front wraps over left & fastens 3/4 of the way along with a 1”/2.5cm covered button in a diagonal buttonhole in the top corner. Waistline is faced with a 1”/2.5cm band attached to the polyester lining. The lining is also attached vertically down the skirt front pieces. Skirt has straight sides. Size 10, machine washable. Waist measures 25”/63cm, hips 36”/91cm. Length 27”/69cm. Fully lined with button and zip fastening at back and slit at back hem. Fits like a modern size: S UK-8 US-4 EU-36. Length waist to hem: 20.5". 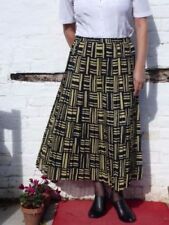 33” long waist 28” Lined in navy Vintage Gor Ray Wool Skirt Uk Size 10 Various shade of blue.Check 1970s. tiny repair needed, see photo.. Dispatched with Royal Mail 2nd Class signed. Strone House The Tartan Weavers Argyll. Box Pleats. Feels Like Wool. If you are happy and satisfied, we are too. Made in Scotland. Dark red needlecord style skirt from Richards. Attractive pencil skirt fully lined zip fastening. Vintage 90s Red Poppy Print Pleated Skirt Size 10 waist 28-29” length 28” hips 36-38” no fabric composition label, it’s probably polyester. Ideal to Wear To Work or Smart Occasion. original belt missing, a thin red or black one would work well. It’s quite swishy and feminine yet formal. lined in bright red.Condition is Used. Dispatched with Royal Mail 2nd Class. Black pinstripe. 1940s style. Pure new wool feel. Looks Sz 12. Waist- 28". Back button & zip. Back vent at hem. Looks unworn. Would suit a UK size 8-10 / EU size 36-38 / US size 4-6 dependant on desired fit. button and invisible zip fastening. side button detail. Fits size: small. length: 22.2". waist: 14". made of 100% cotton. It fastens with an invisible zip and two buttons covered in satin at the back. It is machine washable. It is made from 75% cotton and 25% modal. The lining is 100% acetate. There is an 18cm slit in the back. Gorgeously soft, wool-mix skirt in mid-grey marl with gathered and pleated waist and flat front. Invisible side pocket in each side seam. Side zip with hook and eye fastening on the waist and a 4cm frill at the hem bound with a beautifully soft dark grey satin ribbon. Vintage Laura Ashley Blue Cotton Pleated Skirt. Size 12. Excellent Condition. It is a mid calf length and looks great with flat or low heels or sandals. Heather Valley Tailored in Scotland. Made in Scotland. Checked Blue Brown. If you are happy and satisfied, we are too.